Niet in alle gevallen bestaan er afkortingen en ik heb gemeend die aan te vullen om een efficiënte communicatie over “’t is een vreemdeling zeker” mogelijk te maken. Het is met taal dat onze handelingen en behandelingen geduid worden. Afkortingen zijn onontkoombaar handig en maken tevens distantie tot wat ze representeren mogelijk. Politie, Justitie, Ambulance, Zieken- en Gekkenhuizen en aanverwante diensten hebben een groot aantal afkortingen, waarvan een deel tot jargon van deze beroepsgroep geworden is. Jargon heeft een buitensluitende functie en komt voor in alle geledingen van de samenleving, van politiejargon tot boeventaal. De Gemeenschappelijke Meldkamer van Politie en Ambulance heeft maar liefst 3197 OVV afkortingen on-line staan (OVV = Openbare Orde en Veiligheid). Het gebruik van deze afkortingen heeft een dubbele buitensluitende rol als het om ‘vreemdelingen’ gaat die de Nederlandse taal (nog) niet (helemaal) machtig zijn. Evenals het identificeren en aanduiden van mensen door middel van een nummer humaan gesproken een degradatie inhoudt, zijn deze afkortingen uitdrukking van een gelijke orde. Niet dat ik hier voor enige vorm van cosmetische verhulling met taal van de werking van het vang- en verwijder-apparaat pleit. deed mij nog eens terugkeren naar dat interview van ruim tien jaar geleden…. En in wat meer woorden. Praten en overleggen, het geheim van het poldermodel. Een definitie van wie nu die “sterksten in de maatschappij” zijn wordt in het interview niet gegeven en dat is dan toch een Leerse-onduidelijkheid, zoals blijkt als burgermeesters van alle gezindten in opstand komen tegen zijn dictaat als minister om de ‘zwaksten’ – de tussen-wal-en-schip-migranten – over de door hem getrokken grens heen te zetten. Iemand die ooit (2004) de Machiavelli-prijs uitgereikt kreeg voor zijn “markante bijdrage aan de communicatie tussen politiek, overheid en burgers” en een deconfiture als gevolg van het vermengen van bestuurlijk en persoonlijk belang wist af te sluiten met een groot afscheidsfeest in Maastricht, is nauwelijks te vellen en veert steeds uit de touwen van de politieke boksring terug op het speelveld. In juli 2010 schreef ik al een uitgebreide verhandeling over “Over de Hollandse kunst van je straatje schoonvegen en de bezems van Leers, De Grave en Nijpels”, dat via deze link op dit blog is terug te vinden…. 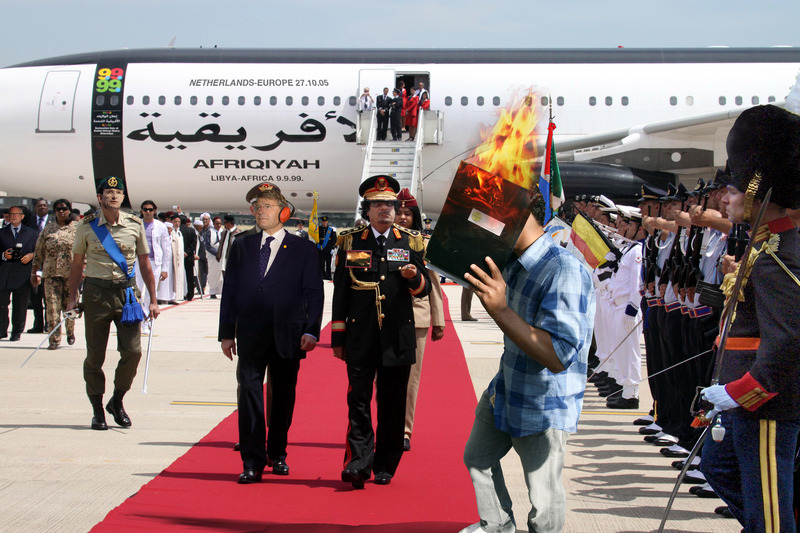 "Hotline MOE-landers (middle and East Europeans (...) leave your story here" click picture for full size. 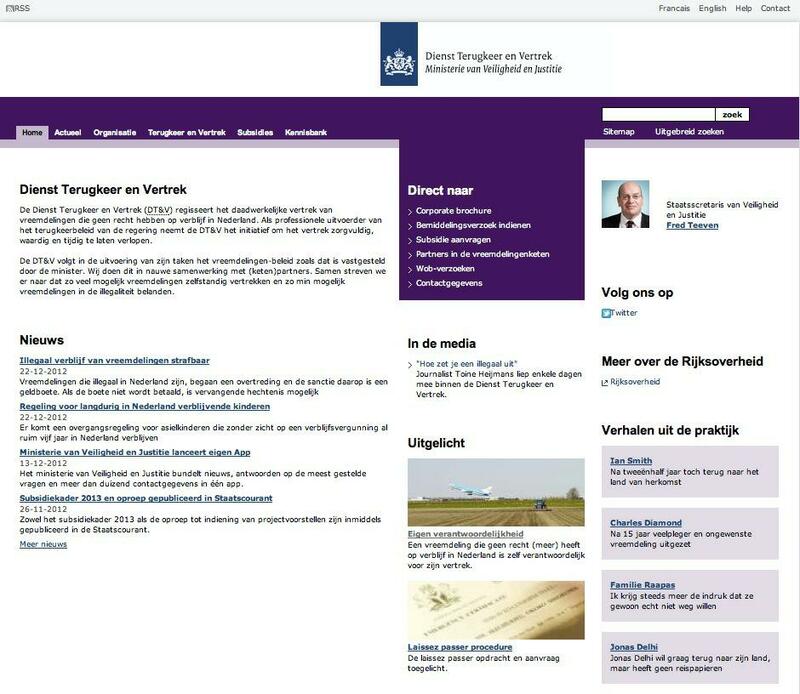 For rough translation of the PVV text in this picture see further on in this article. 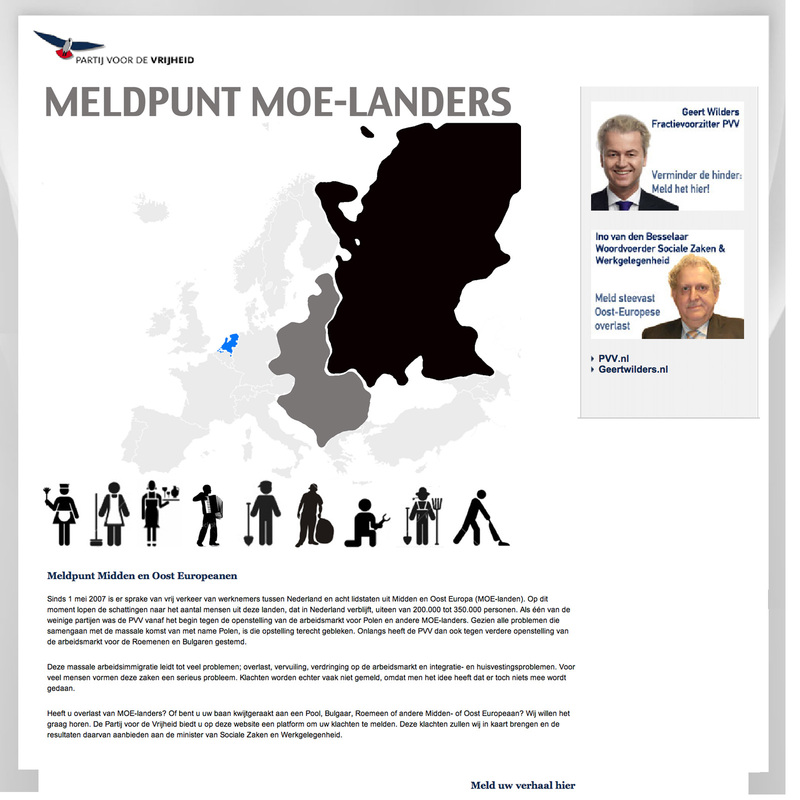 A ‘détournement‘ for the latest campaign of PVV/Wilders group targeting Middle & East European workers… what I see when I check out the Complain Web Site of the PVV. The word ‘MOE-Landers’ is a post Cold War invention, before there was the monolithic term ‘Oostblok (East-block from the East germany/DDR all the way to Vladivostok in Siberia ). MOE is an ‘acronym’ of Midden Oost Europees (Middle East European), which is then glued to the word ‘lander’ (someone from a certain land or country). The word ‘MOE’ in Dutch means being tired. This is an interesting association as the MOE-landers may be coming to the Netherlands because the Ducth lower paid classes are tired (moe) of working for too low wages and in too bad circumstances. The Dutch entrepeneurs are of course the last to complain about willing Middle-East-Europe employees. Wilders and his PVV movement specialise in using generalised ‘statistic group names for humans’ as a basis for their pointing-a-finger-to-others politics. It is not just those belonging to a religious entity like Islam that are targeted by the PVV. The party of Wilders also points to other groupings of people, often groups that have been defined as a specific statistical category by the State Statistical Bureau (CBS). Autochtoon (Old-Greek: αὐτος; autos = “self” and χθων chthoon = “land/earth”) and Allochtoon (ἄλλος (allos) = other; + land/earth) are important ‘catchwords’ to be found in the ‘policy nets’ of the PVV. ‘Native’ and ‘alien’ to use other dividing terms, or simply ‘us and them’. 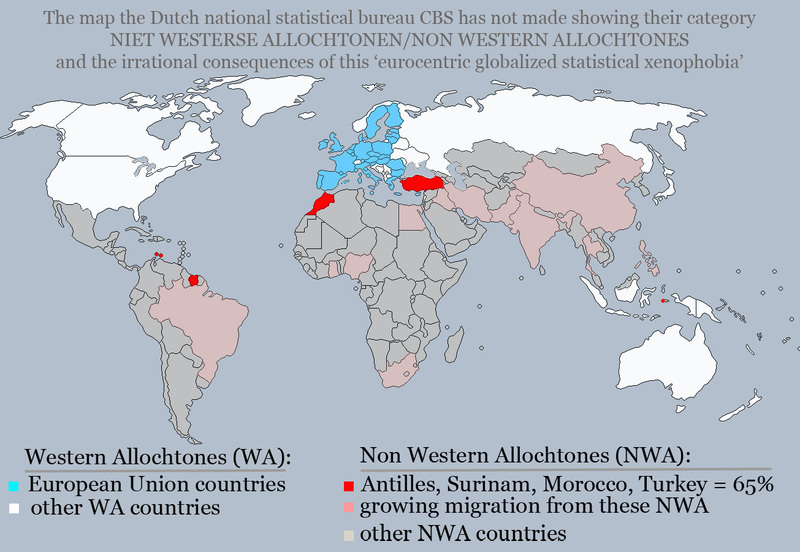 Sub-categories – all neatly defined by the Dutch State Statistic Bureau – are singled out by PVV strategists for their populist campaigns, like the seemingly geographic notion of ‘Niet Westerse Allochtoon’ (non Western Allochtones). NWAers would be an acronym for this group, proposed to us as a non-adaptive foreign element in the mythically national entity of ‘echte Nederlanders’ (real Netherlanders) originating from ‘non Western countries. The last thing is historically and geographically such an absurd notion that it will take a separate article (in the making) to explain it in maps. For the rest I need not detail here the fact that all nations exist only by the grace of migration. The ethnographer searching for a real aboriginal Dutch will have a hard time finding one. This map (by me tj.) does NOT appear on the web site of the State Statistical Bureau of the Netherlands, but is construed from the textual information they give. 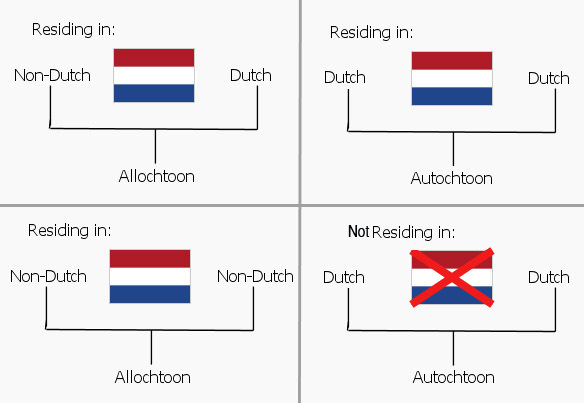 I made it to understand what this idiot term 'Niet Westerse Allochtoon' means. 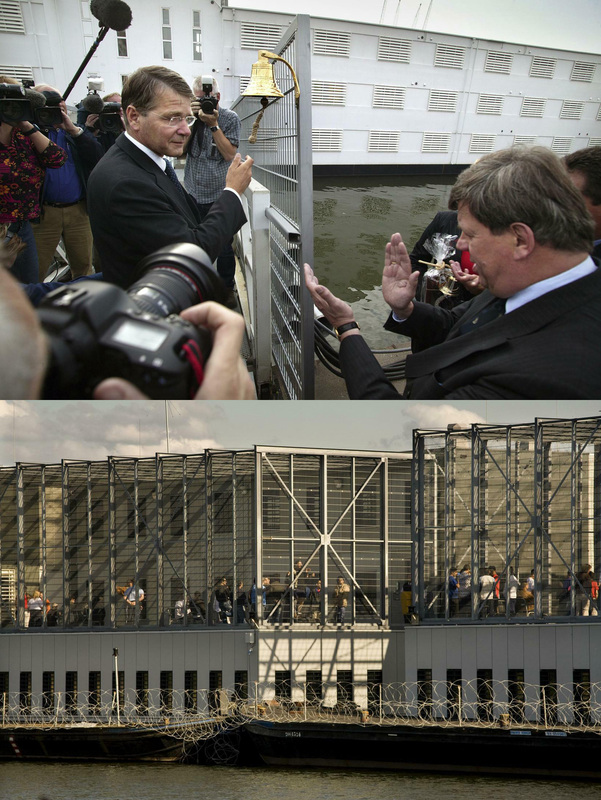 Just before the elections in the year 2010, the PVV financed a study by consultancy bureau NYFER, that managed to construct a demagogical interpretation of the social costs of migration (benefits were not mentioned) focussing on the statistical category of Non Western Allochtones (NWA), claiming this group "costs Dutch society 7,2 milliard Euros a year." These 'statistical lies' were cleverly launched just before people went to the ballots. (*) As the financial crisis had been a part of all television debates between the candidates, who had to explain how they would cut in state budgets and who would suffer from that, and the magic number was 15 milliard, Wilders put forward triumphal how he would solve the 'crisis', by getting rid of NAW citizens. The NYFER report (**) of Wilders failed to be sufficiently discredited (in time) by trade unions, academics, other political parties and so on. (***) It brought Wilders to power with 24 seats in parliament (before he had 9 seats) and the extra-governmental position of power to deliver a majority to a minority cabinet of VVD (liberals) and CDA (Christian centrists). The singling out of MOE-landers as a target is not a new PVV policy. It fits in their long term structural policy of ‘the Netherlands for the Netherlanders’ (Nederland voor de Nederlanders). The definition of what a real Netherlander is – according to the PVV – remains kind of vague. I do not see a ‘jus sanguinis‘ (the fact of being born in a country) approach by the PVV as a basis for citizenship, as Dutch citizenship is something in their opinion that can be taken away from first, second – who knows where it ends – generations of migrants, that have committed a crime. “Send them back to their homeland” is the adage, while – crime or not – these are Dutch citizen born and educated in this country. Middle and East Europeans in the Netherlands: (blue) not registered employee in the GBA (Gemeentelijke Basis Administratie Persoonsgegevens/Municipal Basic Administration of Persons Information); (brown) idem registered. Source CBS . Click image to go the CBS web page. It is certainly not only the PVV who is campaigning against former East-blockers, East-Europeans or MOE-landers. 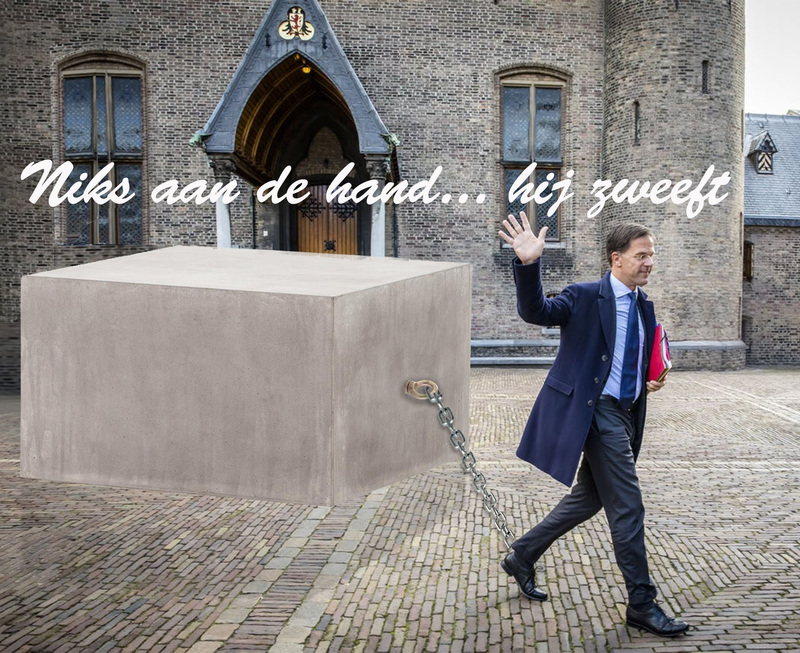 The Liberal Party for Freedom (VVD) – the main power in government now – is in fact the main motor behind the PVV action against MOE-landers. The VVD minister of Social Affairs and Employment, Henk Kamp, proposed already a year ago to expel unemployed Polish workers, not withstanding European accords on free movement of employees. The number of problem cases of such economic migrants, as suggested by the minister last year, have been criticised and relativized by informed sources and members of parliament, accusing the minister of a party-politic election show over the backs of EU migrant workers. What we see is an orchestrated campaign whereby the PVV takes an extremist stand by actions like the call to complain on a web site about MOE-landers (anonymous and without check on double entries if wanted), while the VVD plays it more subtle and indirect. Minister Kamp has a personal campaign, often televised by the NOS television or the State Information Service (RVD), whereby he draws his double sided sword: threatening to scrap the welfare benefit of Dutch unemployed workers, if they refuse to do the jobs now done by the MOE-landers and at the same time move MOE-landers out of their Dutch jobs. Jobs often in the greenhouses of the agrarian export sector. Double sided sword, double side profit, especially for the state, who can earn a few milliards of Euros on this move. Minister Henk Kamp (VVD) of Social Welfare and Employment in a video during a working visit to horticulture firms in the Noord-Oost Polder, filmed by the Dutch State Information Service (RVD), later broadcasted without mentioning its original source by the NOS tv news: "..if you can work and there is work, than you must work." Click picture to go to the RVD information page of this work visit. Kamp (his name means 'camp' in English) speaks about the number of unemployed Dutch workers in the 'polder region', being the same as the number of MOE-lander workers employed there the horticulture . The horticulture entrepeneur explains on camera that these MOE-landers can be called to work on short notice and even for short time contracts only, whereas the Dutch looking for employment in the region are looking for an all around year job. Nobody seems to know the historically speaking distressing association that the Noord-Oost Polder (new land on what once was an inner sea) has consumed a lot of real 'forced labour' when it was laid bare and made into farmland during World War II, including arrested Jewish men that had some (ill-fated) hope to survive here. The agrarian sector itself certainly does not embrace this proposal for a number of reasons: refusal or incapacity of the “real Dutch” unemployed to do this kind of work, because of what is not said in the VVD minister’s campaign, the not so brilliant economic and social conditions offered to workers employed in EU competitive factory greenhouses and the fact that many jobs a only for a short time. The horticulture industry thrives on EU seasonal migrant workers. The media performance of VVD and PVV is perfectly orchestrated these days, with Geert Wilders being attacked for his discriminatory MOE-landers campaign while Henk Kamp appears on television giving him indirect support by saying that it is up to any parliament fractions to take on measures and do researches they deem necessary. What is ‘discrimination’ for one, is ‘freedom of expression’ for another, according to Minister Henk Kamp, being asked about his opinion on the complaint against the anti-MOE-lander campaign by the Polish ambassador to the Netherlands. Since May 1, 2007 there is free movement of workers between the Netherlands and eight countries in Central and Eastern Europe (CEE) countries. At present the estimates to the number of people from these countries, which resides in the Netherlands, apart from 200,000 to 350,000 people. As one of the few parties, the Freedom Party from the beginning against the opening of the labor market to Poland and other CEE nationals. Given all the problems associated with the massive arrival of especially Poland, is that attitude materialized. Recently, the PVV whatsoever against further opening of the labor market for Romanians and Bulgarians voted. This massive labor migration leads to many problems, nuisance, pollution, displacement and integration in the labor and housing problems. For many people, these things a serious problem. Complaints are often not reported, because the idea that nothing is done. Do you have trouble of CEE nationals? Or have you lost your job on a Pole, Bulgarian, Romanian or other Central or Eastern European? We would like to hear. The Freedom Party has a platform on this website to your symptoms to report. These complaints, we will identify and offer the results to the Minister of Social Affairs and Employment. A long and well argued call to the minister that “forced labour tomato picking will be a disastrous undertaking”; Merijntje describes what will happen with strawberry harvesting by workers that are forced and try to evade it in all kind of creative ways. In all detail farmer Merijntje sketches the fanatic posture of VVD minister Kamp in his zealous campaign to have Dutch workers to pick Dutch fruits and the consequences it will have for those law abiding farmers like him. “Just imagine”, he says lifting his arms in the sky, “government falls because of strawberry picking.” The horticulture entrepreneur also knows his classics on prudent politics when he uses the metaphor of the need for the Minister to stop being a hardliner to become “bendable… in the wind, bendable like the reed.” The European Union reality is better understood by farmer Merijntje, than Minister Kamp, when he comes to the plight of all those Bulgarian and Rumanian workers that are employed as season helps by him, already for years, and he recalls the expectation they have to earn something once in a while in the Netherlands. Think about their families, their situation at home often without work.The contrast between the PVV and VVD campaigns and this video discourse from the other side of the field is enormous. Recently similar reasoning by other employers of MOE-landers could be heard in the Dutch media. Still the low level of payment (I doubt if the Collective Payment Agreements (CAO) by the trade unions for this sector of industry is always applied), the meagre working conditions and the social impact of this new kind of EU seasonal migration work, must not be forgotten. We also need to get a better understanding of horticulture market prices, European and international competition, economic risks and profits that are or could be made, to be able to better judge the claims that no other employment schemes – as the one we see now – can be deployed. Having looked at the case at hand of the public discrimination of “MOE-landers”, it seems to be such an anachronism with high overtones of xenophobia and authoritarian control of the labour market. A minister of employment accusing – underneath well formulated lines – ‘profiteering lazy bones’ that do not want to work for a living, threatening them with good beating by cutting their social welfare. Anachronism also of a ‘liberal’ and ‘free market’ propagating VVD party, that switches for electoral reasons to a social poker game. A game that supports a statistical based discrimination of EU citizens. Political liberals that have switched to protectionism and support for outmoded forms of fear and hate of foreigners. Does the VVD of today still fits their own image of a liberal and somewhat progressive party? Are VVD and PVV by now not two faces of the same Janus head? (*) Below the PVV web page on the NYFER report. "10 YEARS IMMIGRATION COSTS 72 MILLIARD EUROS" This web page, dated May 19th. 2010, neatly documents how main stream media have amplified this instance of semi-academic statistical lies: Elsevier Weekly; free newspater De Pers; De Telegraaf a big right from the middle newspaper; RTL television news; NOS Journal (state television news, though they like to see themselves to be independent). Click picture to go to the PVV web page with all these links (all in Dutch). Good News from the BAD POLITICAL FRONT: the building of a new “National Historical Museum of the Netherlands” has been cancelled by the new Dutch government. This is excellent news! Who wants Double Dutch History cast into lots of building materials? Who wants to institutionalize persistent Dutch denialism of their colonial past? Who wants the governmental ‘imagined community’ of the Low Countries to be even further Disneyfied? Who wants to look at the glorified Dutch self-image through the canonized windows of state dependent historians? We have plenty of museums in the Netherlands offering such kind of idealized Dutch-centric history representations, already for decades… the whole idea is a belated 19th century concept of constructing a past that never actually was, to forge a ‘new Dutch national consciousness’ in post-national times. "Daaag Geschiedenis..." ~ "Byeee History..." is what I imagine hearing when seeing the waving bronze woman. The Dutch text is a promotion text in a special design as produced by the launching organisation of the National Historical Museum and reads: "The National Historical Museum stimulates the historical imagination." The orange building in the back is the actual design for the new building now stalled; the white building in front is the former palace 'Soestdijk' of the deceased Queen Juliana by some proposed as another possible national historical museum site; the statue shows the Queen and her husband Prince Bernhard, Juliana waving as she used to do each year when a 'defilé' of Dutch citizens came to congratulate her with her birthday on 'Queensday', the 30th of April. 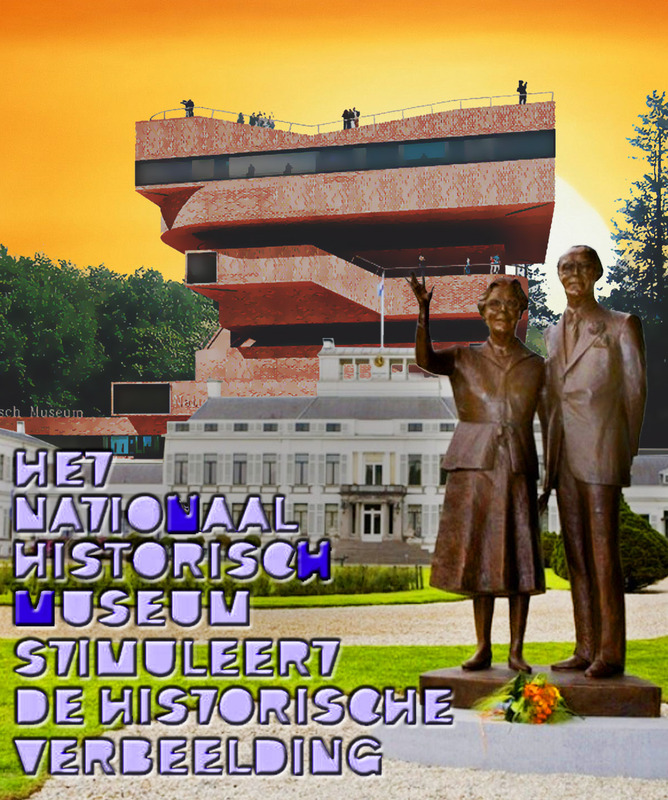 The image shows the design for the National Historical Museum in the Eastern border town of Arnhem and the palace of former Queen Juliana in Soestdijk (in the heart of the country) the last one has also be proposed as a seat for such a new National Historical Museum. The idea for such a museum has been strongly propagated by Jan Marijnissen, the party leader of the Socialistiese Partij (SP). 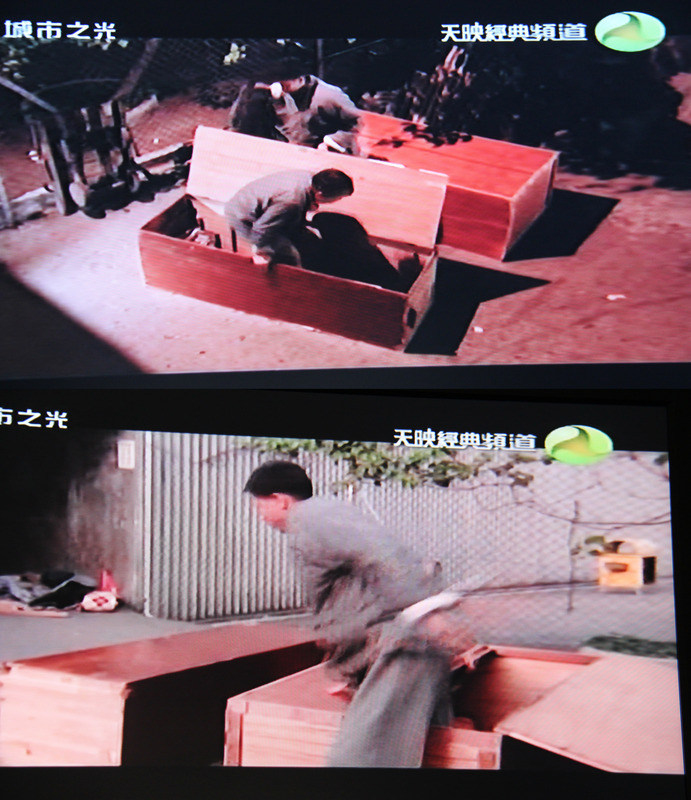 His proposal – dating from 2003 – was later also supported by the Christian Democrat Party CDA, a party now in government and deciding to stall the whole museum building project. As it is a ‘national Dutch’ project, I fail to find English language links on the subject. That in itself may be seen as symbolic for the whole undertaking, a sign of the isolating tendencies in Dutch politics of the last decade, moving away from a more internationalist position before. Een volk zonder geschiedenis bestaat niet. Elk volk, ook het Nederlandse volk, heeft dus een geschiedenis. De hedendaagse verwarring over onze morele, culturele en politieke identiteit vindt voor een deel haar verklaring in het ontbreken van historisch besef in brede lagen van de bevolking. 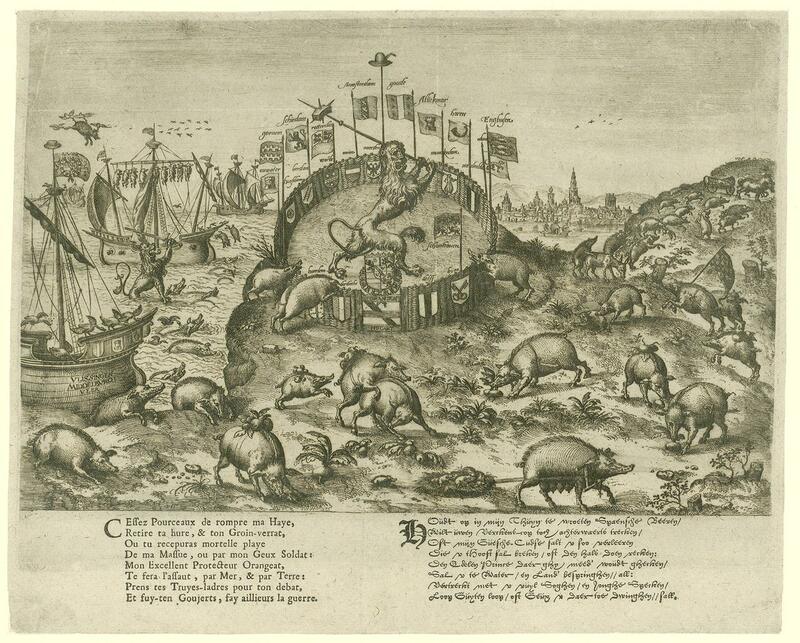 Marijnissen acknowledges the existence of many museum institutions and the cornucopia of objects and methods of display on Dutch history, offered by them, but he regrets that nowhere “the rise of society in the Low Countries at the Sea (he uses the conjunction ‘wordingsgeschiedenis’ = history of coming into being) is told. In other words he is longing for a singular narration of national history. Echter, hét verhaal van de wordingsgeschiedenis van (de mensen die wonen in) “de lage landen bij de zee” wordt nergens verteld. In het kader van een herwaardering van het belang van historisch besef zou het goed zijn als dat wel zou gebeuren. His longing for a singular ‘grand narration’, a genesis of the the Low Countries, is something that frightens me because put in practice, it will be more a product of ‘imagination’ and ‘believe’ than of ‘history’. Such a singular story is the opposite from what I envisage as the practice of history: dynamic confrontations of differing views. It will more hamper than help, the finding of a ‘social identity’. 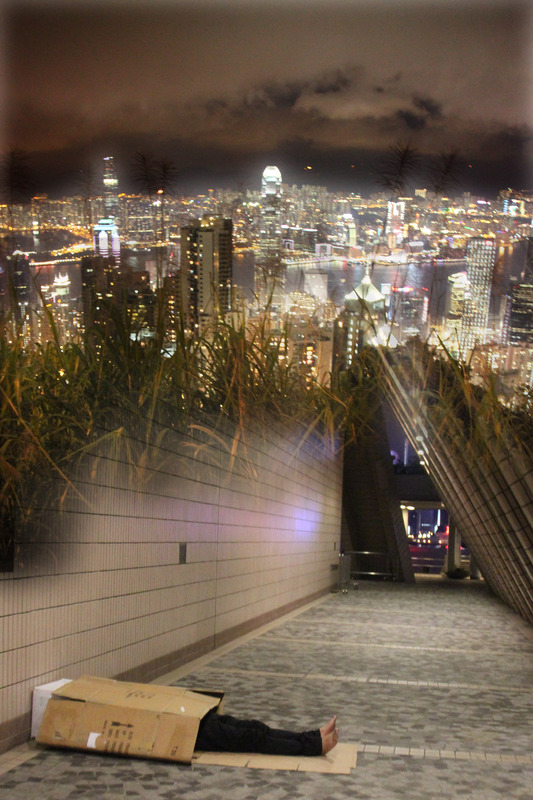 In my vision we need not put our energy in redefining what is ‘Dutchness’, but better come to an understanding of the multiple identities and the plurality of the social territories in which we are living. The times of the fenced off Garden of Holland (Het Hof van Holland) with a gate defended by a lion with a sword, lay far behind us. Already in its time this was an allegory of a non-reality. Man is both a migratory and a sedentary animal. Nations are ‘imagined communities’ and the new narratives we need, do not fit in any ‘national building’. loop guyten loop oft Geux u daertoe dwinghen sall. 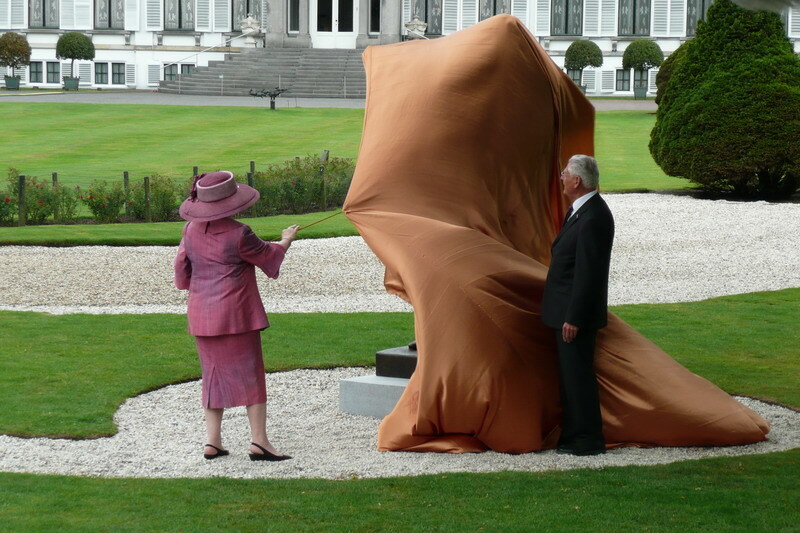 An interesting photograph of the inauguration of the statue of the former Queen Juliana and her husband Prince Bernhard by queen Beatrix can be found on a royalist web site and the photograph below, showing the unveiling in the year 2009, while the wind blows the orange drapery into the shape of the tower with its shifting floors as can be seen in the design for the new National Historical Museum. The design of the Historical Museum dates from 2007 and is by one of the founders of the architect association Mecanoo, Francine Houben (1955-). Statue designed and made by Kees Verkade (1941-) in 2009. Building designed by Francine Houben (1951-) in 2007 and stalled in 2010.